The boys from F&M, an Italian coachworks and high-end resto house that dabbled in carbuilding last year with the Antas V8, is going for broke. The company recently announced it will show a production version of the GT one-off it showed at the Top Marques show in Monaco last year. This year at Top Marques, which takes place next month, the company will show the production version of the same car. And by production, we mean "just a few." 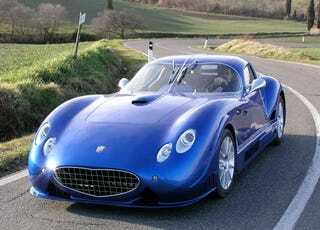 If you'll recall, the Antas V8 is a hand-built GT whose antecedents are the Bugatti 57 from the 1930s and Maseratis from the 1950s. Even the carburated Maserati engine, producing 310 horsepower, is a throwback to velocity stack'd wonders from the 1960s. No word on price, but each purchase will come with a DVD of the car being built. The perfect thing to bore the hell out of less well-heeled relatives on Thanksgiving.